You can expect more with family. Auto accidents, slip and fall, personal injury. "AV" Preeminent personal injury attorneys in Tampa, providing exceptional legal representation in a professional yet compassionate manner. Mike and Claire Hancock have 30 and 28 years of experience, respectively, in personal injury litigation. They not only work in the Carrollwood community but also live in the community as well as contribute their time to Carrollwood organizations. This includes the Carrollwood Bar Association, the Community Food Pantry and the Carrollwood Area Business Association. As a husband and wife team, Mike and Claire understand the importance of family. They believe they aren't just representing their clients, but their clients' families as well. Yes, Hancock Injury Attorneys is not a big “advertising” firm that you hear about constantly, and we like it that way. This way we are able to give each and every single client a personalized experience and make sure they feel like they are a part of our family. Why? Because no one protects you more than family. When you come in, you will meet with Attorney Mike Hancock; not a paralegal or assistant. He will be involved in every single part of your case along with Attorney Claire Hancock if your case proceeds into litigation. 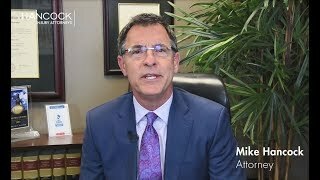 You should always feel welcome to call Attorney Mike Hancock but hopefully you feel like you will not have to, as our goal is always to keep you updated to the fullest extent with the assistance of our experienced paralegals. Among other charitable organizations for which he volunteers, Mike Hancock serves on the Board of Directors of the Carrollwood Community Bar Association and has served Legal Counsel on the Board of Directors of the Carrollwood Civic Association. Select case type... Alternative Dispute Resolution Amusement Park Liability Automobile Accidents Automobile Insurance Automotive Products Liability Boating Accidents Civil Litigation Commercial Real Estate Head and Spinal Injuries Insurance Litigation Mediation Motorcycle Accidents Negligence Personal Injury Premises Liability Products Liability Railroad Accidents Real Estate Resorts and Leisure Seat Belt Injury Sinkhole Claims Slip and Fall Torts Transportation Travel and Tourism Whiplash Wrongful Death Other Case type is required.